Uncategorized | What a book! The second in a series of books about two lawyer brothers who have offices at 221 B Baker Street in London, famed address of Sherlock Holmes. As I mentioned in the review of the first book, the author is a Boilermaker, so I am “reading local” or whatever you want to call it. I enjoyed this one more than the first. Like the first, I don’t think the chain of events would stand up to the way the law really works, but still, reading these is like watching a fun detective show on television. They are quick reads and I heartily recommend them as good books-to-read-when-you’re-in-between-books reads. This installment finds the Heath brothers back in London, with Reggie going back into criminal law to defend a cab driver accused of murder. All the while, he is still getting letters addressed to Sherlock Holmes (because he’s at the address), with one coming from a vengeful “descendent” of Professor Moriarty. One note, I was hoping to find that the name of a character would be an anagram of a famous Holmes character, and it comes so close, but not quite. It would have been a nice touch. The narration is by the terrific Simon Vance, which I credit a good portion of my enjoyment of this book to. You really can’t go wrong with an audio book narrated by Vance. The Percy Jackson books were OK for me (my son and daughter both really like those) and this was described to me as “Percy Jackson but with Egyptian myth.” And it kind of is, but I liked this one a little better. I did not care so much for the device of alternating chapters between the Kane siblings, Carter and Sadie, recording the events of the story for you to “listen” too, as the narrative unfolds in such a way that you wouldn’t tell it that way if you were recording it, but I don’t think a kid’s really going to notice or care. That said, that did allow Riordan to develop two main characters really well. Carter and Sadie are both quite distinctive, with both having important roles in the story and not being in the shadow of the other (eg, neither cliche of Sadie being overshadowed by her big brother or Carter is outdone by Girl Power of little sis is present here). Each needs the other’s special skills and abilities. Overall, this will be a great read for kids and a nice “in between books” read for adults (actually, it’s much better than a lot of adult level books you could read). And while it may look thick, the chapters move quickly and the final battle (there’s always a final battle) will keep you turning pages. Quick recommendation: I read somewhere, I can’t remember where, that the current armed forces are the most literate soldiery in world history and the volume of war memoirs in the past few years are proof of this. I heard this author interviewed on NPR and he was very funny, which made me read the book. The book, of course, wasn’t always funny because it is about war after all. It is funny, sad, heartbreaking, and sometimes inspiring. There are a number of excellent war memoirs, so many you certainly can’t read them all. Be sure to make time for this one. I’ll be honest, I was sucked in by the cover. This just looked cool. How refreshing to find it was hard SF too, which I have been neglecting of late. So what happens is this ship full of comet miners is sent to intercept Saturn’s moon Janus, which has suddenly left its orbit and is flying through space, directly for the star Spica, shedding ice as it goes to reveal a metallic surface. What is it? Who made it? The crew of the Rockhopper are sent to find out. But things go wrong, as they always do in novels, and this first-contact story takes some twists that you don’t always see. The story, to me, was more about two strong people, who suddenly find themselves on opposite sides of an issue and what happens as a result. This novel could have easily been set in frontier America, Victorian England, modern Texas, anywhere really. But it’s the freeing from present-day restraints that science fiction allows that really makes a story like this engaging (see ‘The Moon Is A Harsh Mistress’ by Robert A. Heinlein) as it explores its ideas. About the hard SF part: Reynolds is an astrophysicist, which keeps the science and even the geopolitical parts of the story fairly well grounded in some kind of plausibility. Character-wise, well, I would have liked to have seen a little bit more from some of the characters, but I will say there is no confusing characters in this book. Each is distinctive. Some people may find the fact that some basic questions a reader might ask aren’t answered. But I think that’s part of the point. The Earthlings who are finding their way in this book don’t have all the answers, and they find them, some of them anyway, at the same speed as the rest of us. I’ll admit, I read (well, listened) to this book because of hype and peer pressure. I generally don’t like too many mysteries, but I am glad I at least read this one. It starts out way boring enough though. The however many pages about a libel case and the background story about how it came about is just numbing. Which is weird, because Larsson was a journalist; he should have known his lede needed to be trimmed. But once Lisbeth Salander is introduced, the story picks up and she certainly lives up to all the hype. She’s one of the more refreshing characters (heroine? anti-heroine?) in mysteries because she’s not as cliche as so many seem to be. The violence toward women in this book can be a little repellent, but the point is, well, I hope the point is, that it is a serious problem anywhere, even places that are held up as perfect in the U.S. (eg, Sweden, France, wherever). I guess if I knew more about Swedish society and current issues, some of this book would have made more sense to me, as I have read that Larsson’s whole Millennium trilogy is meant to be a criticism of Swedish society. But once you see who has what skeletons in their closets, you kind of figure out who Larsson’s targets are. They aren’t much different than those in U.S. novels and movies. A note on the audio edition: The excellent Simon Vance is the narrator and rather than fight, and lose, with bad Swedish accents, he simply uses different British accents for his characters. That works fine, although I have recently listened to his narrations of the Dune and James Bond novels. So for a disc or two, Mikhael Blomkvist sounded like Duncan Idaho and Henrik Vanger sounded like M. But that’s not a complaint, it’s just funny. The upshot: Read this before the movie comes out, so you won’t look like you’re behind the bandwagon, but you can still chat about it around the watercooler. An enjoyable non-horror-ish novella from Stephen King. King is a baseball nut, but he doesn’t bog down the story in too much baseball detail. If you aren’t into the sport, you might feel a little disinterested, but, as usual, King drops enough juicy tidbits to keep you reading. And, as usual, King drops enough vulgar colloquialisms to keep you laughing throughout. You feel like you’re really listening to an old baseball codger in a rest home eager to talk to somebody about something, anything, as long as he doesn’t have to join the virtual bowling group. I listened to this as an in-between-books book. It was short, light and fun. Craig Wasson is a great reader, although I felt his voice sounded a little too young for the character who was narrating. But it’s a minor quibble. He does a terrific job otherwise. I did not listen to the other story in this edition, ‘Morality’, as I had read it when it was originally published in Esquire. I didn’t like it as much then and so was ready to move on to my next audio book. I’m from New England and I majored in history, so this book seemed right up my alley. My worry with these type of ‘Mystery of History’ books is that ever since The Da Vinci Code hit it really big, a slew of books, some good, some not so good, dealing with long forgotten tomes and mysterious past occurrences have been published (Codex, The Geographer’s Library, The Rule of Four, etc.). I am glad to see these books getting published, as the best-written ones can be very exciting without a submarine or secret decoder ring in sight. Plus I’m a sucker for historical details. That said, ‘Deliverance Dane’ is OK. It moves a little slow at first, with a little too much description of minor, or unneeded, details. The life of a grad student, I would think, makes for a bit of a dull novel, but understanding some of the academia detailed, I was able to stay with the story. The narration was good, although some of the narrator’s New England accents were a little distracting, but so are New England accents if you didn’t grow up with them, or at least live with them for a while. The book was interspersed with ‘Interludes’, that flash back to the Salem Witch trials and the toils of the title character and her offspring. I always liked this storytelling device because it allows the author to sneak in some suspense by leaving off the main narrative and freshens things up some. I liked them in this book. It’s when the book reaches part two that I found it a little more interesting, but I recognize that some readers may not be able to handle the break with the first part. I didn’t think part one did enough to build up the possibility of magic being real for the reader so that when suddenly — Magic! — pops up, that the casual reader wouldn’t just say “What the heck?” and put the book down. I liked the characters well enough, although when the villain was finally revealed (you kind of know who it will be all along, so waiting to see what Connie, the main character does, is the real suspense), the villain’s villainy didn’t seem all that villainous. But, again, there were no submarines, no tanks, no spycraft. What I thought was really cool was the author’s postscript, where she talks in more depth about the Salem Witch Trials and brings up the point, as does one of the characters, that the people in 17th century New England believed that witchcraft was being practiced and it was real, as real to them as car theft or murder or reckless driving is to you and me. And she asked herself the question, what if the New Englanders were 100 percent right? What if people were not only practicing witchcraft, but some people actually had the hang of it? And that idea alone made this worth a read (or a listen, in my case). If you liked: the aforementioned Codex, The Geographer’s Library, The Rule of Four or perhaps The Historian, you might give this a try. Lee Child has a Jack Reacher book coming out Tuesday. Steve Martini has a Paul Mandrini book June 1. John Sandford has a Lucas Davenport book coming out, also on Tuesday. I’m still catching up with Michael Palmer. Oh my. Oh my. Oh. My. When his twin brother, a homicide detective for the Denver P.D., commits suicide after being unable to solve a particularly grisly murder that he’d been obsessing over, Jack McEvoy, a violent crime-beat reporter for The Rocky Mountain News, deals with his grief and the five stages of denial the best way he knows how. But while tracking down his brother’s last few days for his next story, when things don’t quite add up, the reporter comes to the conclusion that it wasn’t a suicide after all but a carefully staged murder. And then, when his research into police suicides nationwide turns up a disturbing pattern of an unsolvable murder, followed by the lead detective’s suicide, complete with a cryptic suicide note consisting of a quote from Edgar Allen Poe, McEvoy realizes his brother was the latest victim of a serial killer. 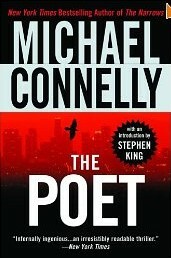 Probably better known for his crime novels featuring LAPD detective Harry Bosh, regardless, I jumped into author Michael Connelly’s “pool” with The Scarecrow, the second novel featuring his other reoccurring character, reporter Jack McEvoy, which quickly sent me searching for his inaugural adventure, The Poet. McEvoy is very good at his job, perhaps a little too good, meaning some clues he digs up or patterns he sees are so damned obvious that nobody else has seen them is a bit of a stretch. However, find the patterns he does, and that turns out to be the easy part as now he has to convince his boss, the police, and eventually, the F.B.I. that a deranged killer, or possibly two deranged killers, is moving across the country and leaving a lot of bodies in his/their wake. And convincing that last group brings him to the attention of Special Agent Rachel Walling for a little joint-investigating and the prerequisite boot-knocking. To tell his story, Connelly splits time between McEvoy and the killer. Fairly blunt and straight forward with his plot, from what I’ve read so far, the author likes to keep things simple as the mystery methodically unravels and saves the big twist for the end. And in the case of The Poet, it’s a pretty big one. If I have one major beef with the plot it’s the whole body in the locked room scenario for the suicide victims, who leave the quotes from Poe in their own handwriting. Here, the author kind of paints himself into a corner, and how he gets out of it will give the credulity muscle in your brain a good stretch. And for those of you who like the squickier side of these serial mysteries with the accompanying blood and guts may want to look elsewhere as we’re mostly dealing with the murders after the fact. Still, if you like puzzles and authors that reward you with pieces as you go along, you’ll probably like the final picture Connelly provides for you.